I didn’t have the luxury of getting to know my little sister as well as I would have liked growing up. I was raised by my grandma (my dad’s mom) and Melonie was raised with our mother. Our mom didn’t offer the best of environments for her growing up, so needless to say she’s had her share of challenges along the way. I was very fortunate to grow up with my grandma. Although she was very strict, I appreciate every sacrifice she made for me, all the rules I had to follow and for giving me the chance to grow up within a much more positive atmosphere. Today however, my sister (28) and I (33) share a very special thing in common – motherhood. We are both moms of two little boys of the same ages & stages. We both have a four-year old and a ten-month old. Ever since I was little, I wanted a relationship with Mel, but because of the differences in our lives, it was never quite possible. But now, these little boys have brought us closer. We spend a lot of time together, which is great for us and the kids. I’m so glad that we both reached a point in our lives where we could become the “sisters” I’ve always hoped we would be. And I love that our little boys will grow up close to each other, as one of the greatest memories of my childhood was playing with my cousins. Although I had lots of aunts, uncles and cousins around me while growing up, and I’ve always had an “entourage” of friends nearby, nothing makes me happier than having my sister. 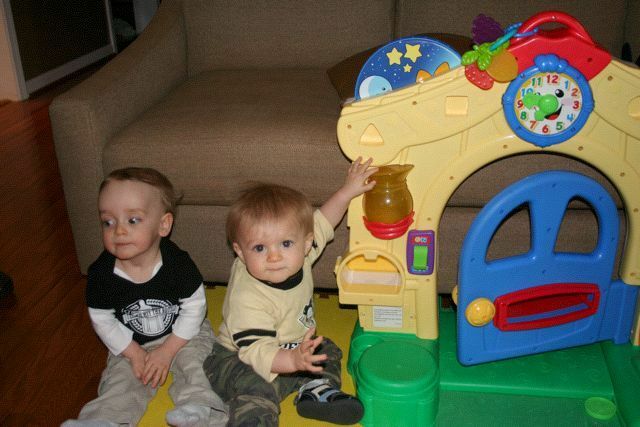 I look forward to many memories to come as well as knowing that my boys will have each other as they grow up too. 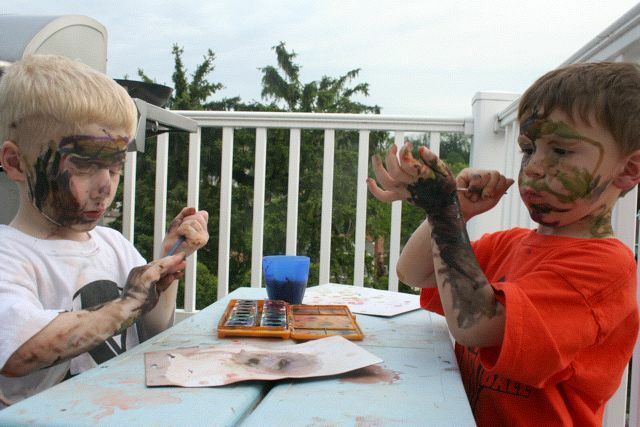 Just the other day, Gaige (almost 4) and Eion (4 ½) were on the deck having a grand old-time watercolor-painting themselves, while Gavin & Finn (both ten-months) baby-yelled at each other over the toys. There’s nothing sweeter. And nothing that makes us laugh harder together.